Al-Aqsa preacher says Jerusalem will remain the key to peace and war. Tens of thousands of Muslims prayed on Friday at the Al-Aqsa Mosque in Jerusalem and listened to the sermon of Imam Ismail al-Nawadeh. In his sermon, Nawadeh said that the city of Al-Quds (the Arabic name for Jerusalem –ed.) is the holiest place for Arabs and Muslims, and there is nothing like it in its holiness except for the cities of Mecca and Medina. 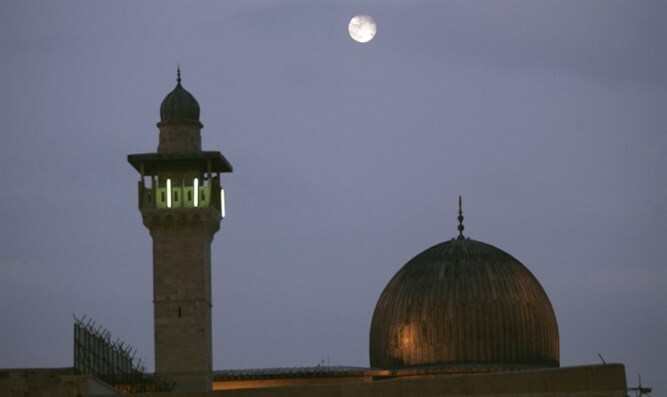 "The Jerusalem, Palestinian and Islamic awakening that we witnessed in response to the attempt to change Al-Quds's characteristics and harm it is proof of this (of the sanctity of the city)," said Nawadeh, according to the Hames-affiliated Palestine newspaper. He stressed that the Muslims have the legal right to Al-Quds and no one has the right to give up this holy place. Nawadeh said that Al-Quds would remain "the key to war and peace." Tensions rose recently in Al-Aqsa and the Temple Mount after Israel placed magnetometers and additional security cameras around the entrances to the holy site, following a terrorist attack at the compound in which two Druze police officers were murdered. The security measures prompted an outcry from the Palestinian Authority, the Jordanian Waqf, and the Jordanian government, which demanded a return to the status quo. Israel subsequently reversed course and decided to remove the metal detectors and security cameras from the compound.